As a combat sport, Muay Thai relies on the human body for both offense and defense. Relying on the use of the fists, elbow, knee and feet, knowing how to use them effectively is important for those who want to become great Muay Thai fighters.Due to the lack of any real weapons, defense in this combat sport can be hard and are often classified into these different types of defense techniques. • Blocking. As the name suggests, blocking is something as simple as preventing one from getting hit. In Muay Thai, one of the most common and most effective blocking techniques is the 45 degree block. This is used to block straights, elbows and even high kicks. The 45 degree block also makes it a lot easier for one to counter off a strike even when one is in striking range. Redirection. By using soft parries, a defender can change the direction of a strike to any that he would like. For example, a downwards tap can easily be used to redirect a kick so that it misses its intended target. Avoidance. This technique is best described by moving a certain body part out of attack range. A good example is when one moves their front leg backwards to avoid getting hit by a low kick. Not only will this lead to a miss, but the defender can also counter with a roundhouse kick easily if necessary. Evasion. Unlike Avoidance, evasion techniques require the defender to completely move out of range of any strike. This makes it easier for attackers to miss, but the defender may also have a much harder time landing a counter attack as well. Disruption. 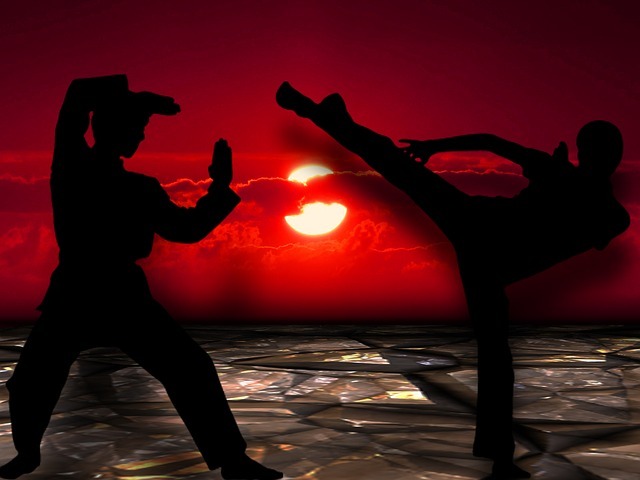 Using jabs, low roundhouse kicks and even foot-thrusts, a defender can easily pre-empt an attack. This is useful when attempting to keep attackers on their guard at all times and to prevent them from getting too close. Anticipation. This technique comes either in the form catching a round kick or from counter attacking before it even gets a chance to land. This requires extensive combat experience so that one knows what body movements are often involved in the different types of strikes. The Wall. This technique uses the shoulders, arms and legs in defending. For example, a raised shin can block low and mid body roundhouse kicks while the forearm and elbow can block high body strikes. There are also other stances useful for defending, some of which are rather complex. If one is in excellent physical condition, this wall of defense makes it hard for attackers to land strikes. Being a combative sport, a good defense is as important as a good offense when it comes to becoming a successful Muay Thai fighter.